Ever wondered what it means to be an adult? I’m not talking about buying guest towels or renters insurance. I’m talking about how we ought to be developing in adulthood. How should we be perceiving and engaging with the world? Or handling conflict and interacting with the people around us? With children it’s easy. Children have distinct developmental stages and rituals (terrible twos, bar mitzvah, sweet sixteen), so we pretty much know what to expect when they grow older. But what about adults? For most of us, adulthood just happens. We don’t have a framework for adult development that can help us understand where we are and where we want to be. This is where Dr. Robert Kegan’s Theory of Adult Development comes in. Kegan (a former Harvard psychologist) shows that adults go through 5 distinct developmental stages (just like children). Becoming an ‘adult’ means transitioning to higher stages of development. It means developing an independent sense of self and gaining the traits associated with wisdom and social maturity. It means becoming more self-aware and in control of our behavior, as well as increasingly aware of, and better able to manage our relationships and the social factors affecting us. However, most of us — about 65% of the general population — never become high functioning ‘adults’, i.e. we never make it past Stage 3 (out of 5 Stages!). We still lack an independent sense of self because so much of what we think, believe, and feel is dependent on how we think others experience us. So how can we transition to higher stages? This article will review Kegan’s Theory of Adult Development. Part 1 will outline Kegan’s Stages 2–5 because being aware of the different Stages can help us better understand ourselves and the people around us (friends, partners, children, etc.) and gives us something to aspire to. I encourage you to read each stage carefully and think about which stage you’re in, and where you’d like to be. Part 2 will focus on how to get transition to the higher stages of development. 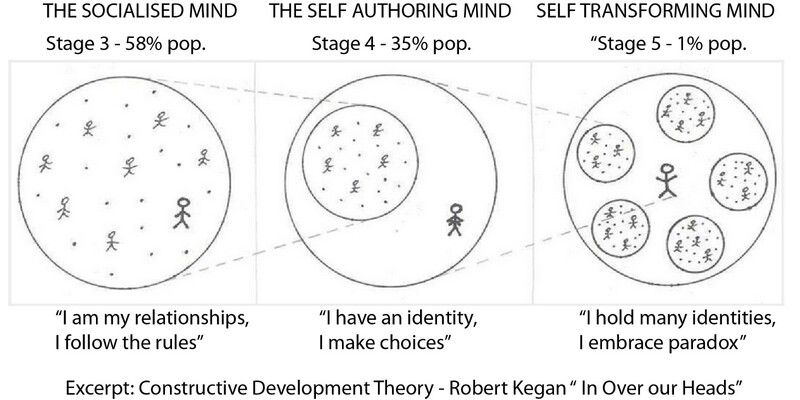 Kegan’s theory outlines 5 distinct stages of development (Stages 1 -5). Most of us are in transition between stages. Many of us think that being an adult simply means getting better at what we do (i.e. acquiring more skills and knowledge). Kegan would disagree. According to Kegan, becoming an adult isn’t about learning new things (adding things to the ‘container’ of the mind), it’s about transformation — changing the way we know and understand the world (changing the actual form of our ‘container’). Transformation is akin to a “personal Copernican shift”. Prior to Copernicus we thought the earth was the center of the solar system. Then Copernicus came along and showed that the sun is at the center. So while nothing physically changed, our entire conception and perception of the world was transformed. This happens to us all the time. Think, for example, of a book you reread from high school. While the information is the same (same words, same book), the way you experience and understand the book (and the world!) is fundamentally different. This is transformation. It’s only through transformation that we can transition to higher stages of development (this is also why personal tragedy can be such a catalyst for growth). Transitioning to higher stages requires a subject-object shift — moving what we ‘know’ from Subject (where it is controlling us) to Object (where we can control it). This is my favorite part of the theory. It’s based on the premise that the more in of our lives we take as Object, the more clearly we can see the world, ourselves and the people in it. Subject (“I AM”) — Self concepts we are attached to and thus cannot reflect on or take an objective look at. They include personality traits, assumptions about the way the world works, behaviors, emotions, etc. Object (“I HAVE”) — Self concepts that we can detach ourselves from. That we can look at, reflect upon, engage, control and connect to something else. For example: Many of us experience a subject-object shift with regards to religion. When we’re young our religion is subjective — i.e. I’m Catholic, I’m Jewish — and dependent on our parents or community. We don’t have the capacity to analyze or question these beliefs. When we’re older, religion becomes more objective — i.e. I’m no longer my beliefs. I am now a human WITH beliefs who can step back, reflect on and decide what to believe in. 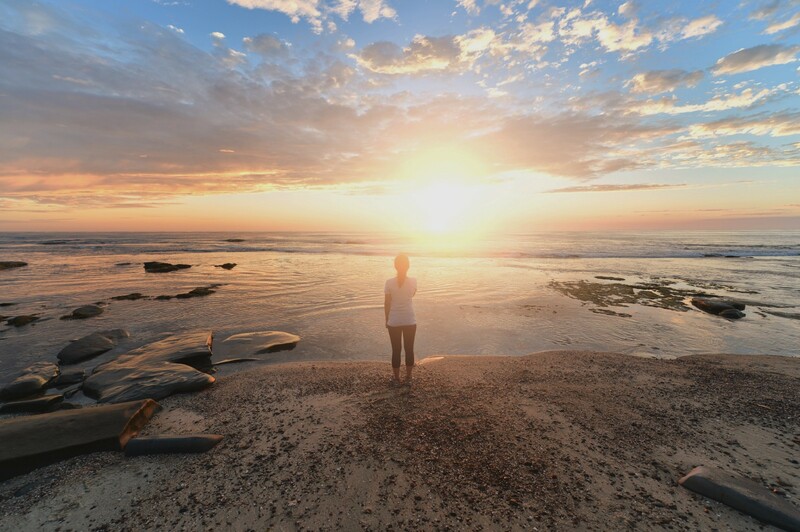 From my experience, the more I can step back and analyze, reflect on my own behavior, feelings, desires and needs, the more I can operate from a place of wholeness, peace and strength. This is also very similar to Buddhist ideas around detachment. Suffering arises from over-identifying with our thoughts, beliefs, emotions, etc. The solution? Detachment. Detachment is not indifference, it is the act of viewing these things objectively, i.e. I am not my feelings, emotions, past or beliefs, I have .feelings, beliefs, emotions, etc. Transformation and the subject-object shift are critical for adult development. I focus on Stages 2–5, because they’re most applicable to adult development. Most of the time we’re in transition between stages and/or behave at different stages with different people (i.e. Stage 3 with a partner, Stage 4 with a coworker). The ‘goal’ is to pay attention to which stage we are at, when and with who. Only then can we deliberately work to change our perspective, thoughts, feelings and actions. Notice as you transition to new stages what was once subject becomes object. Stage 2 used to include only adolescents, but many adults never get past this stage. I feel like we all know a person who falls into this category. In Stage 2, the emphasis on one’s own needs, interests and agendas is primary. Relationships are transactional. Stage 2 individuals view people as a means to get their own needs met, as opposed to a shared internal experience (how we feel about each other). They care about how others perceive them, but only because those perceptions may have concrete consequences for them. For example, when Stage 2 friends do not lie to each other, it is because of a fear of the consequences or retaliation, not because they value honesty and transparency in a relationship. Moreover, individuals follow along with rules, philosophies, movements or ideologies because of external rewards or punishments, not because they truly believe in them. For example, a person in Stage 2 won’t cheat because they’re scared of the consequences, not because it goes against their personal values. Most of us are in this stage. In Stage 3, external sources shape our sense of self and understanding of the world. Whereas in Stage 2 the most important things were our personal needs and interests, in Stage 3 the most important things are the ideas, norms and beliefs of the people and systems around us (i.e. family, society, ideology, culture, etc. ). For the first time we begin experience ourselves as a function of how others experience us. For example, we take an external view of our ourselves (“They’ll think I look stupid”) and make it part of our internal experience (“I am stupid”). We get our thoughts, beliefs, morals (what we know to be true) from external sources. We take too much personal responsibility for how other people experience us. As a result we spend too much energy trying to avoid hurting other people’s’ feelings. We look for external validation to derive our sense of self. For example, a student doesn’t know whether he has successfully mastered a subject until he sees his grade on a test; an executive doesn’t know whether a particular meeting was successful or not until her colleagues tell her it was. We don’t have an independent, strong sense of self. When there is a conflict between important ideologies, institutions, or people, we have a hard time answering the question: what do I want? We’re too busy focused on others’ expectations or societal roles. We no longer view other people as a means to an end. We can internalize others’ perspectives and actually care about others’ opinions of us — not just with regards to the consequences of those opinions. For example: I care that you’re angry with me because I care about you and our relationship, not just because if you’re angry then you won’t invite me to your party. Stage 3 cheater— feel guilty and a disturbing dissonance because cheating is wrong and goes against his/her belief system and values. For many people, social maturity seems to stop here. However, the potential for continued development continues onwards and upwards. According to Kegan, about 35% of adults live at this stage. In Stage 4, we can define who we are, and not be defined by other people, our relationships or the environment. We understand that we are a person, with thoughts, feelings and beliefs that are independent from the standards and expectations of our environment. We can now distinguish the opinions of others from our own opinions to formulate our own “seat of judgment”. We become consumed with who we are — this is the kind of person I am, this is what I stand for. We develop an internal sense of direction and the capacity to create and follow our own course. We can question expectations and values, take stands, set limits, and solve problems with independent frames of mind. We can explore other thoughts and feelings, creating our own sense of authority or voice. We generate our understanding of the world and are not unduly shaped by the context in which we find ourselves. We realize that we’re always changing, that who we are is something that we can still negotiate. Only 1% of adults reach Stage 5. In Stage 5 one’s sense of self is not tied to particular identities or roles, but is constantly created through the exploration of one’s identities and roles and further honed through interactions with others. This is similar to the Buddhist concept of an evolving self — a self that is in constant flux, ever changing. We are both self-authoring and willing to work with the authority of others. We can not only question authority, but also question ourselves. We are no longer held prisoner by our own identity. We see the complexities of life, can expand who we are and be open to other possibilities — we are reinventing our identity. Our identity is limited — our circumstances in life will continuously change and our identity needs to change with it. We can hold multiple thoughts and ideologies at once. We can understand things from many different perspectives. Now that you’ve reviewed the stages, which Stage do you think you’re at? And where would you like to be? According to Kegan, we all believe we’re in a higher stage than we are. So pay close attention to how you behave across contexts and with different people. In Part 2 I’ll review strategies for transitioning from Stage 2 or 3 to the higher Stages (4–5). I started a monthly(ish) newsletter where I share more thoughts/ideas plus meaningful bits and pieces from the web. If you’re interested in receiving it, you can subscribe here.